I was hoping for yet another edition of Chatterbox based around fan requests this morning. Yet, as it so happens, there was a curveball thrown by the organization with goaltending moves taking place. Marek Mazanec went up to the Nashville Predators and Juuse Saros didn’t get reassigned to take his place. 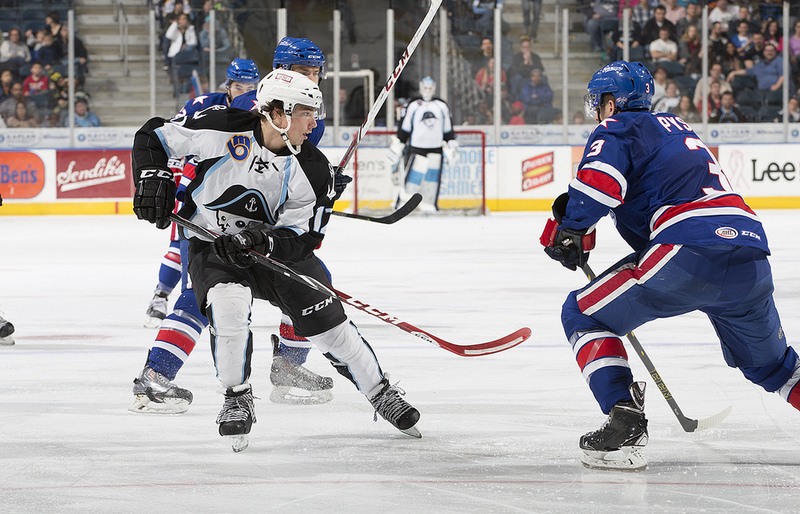 Instead, Mark Visentin was recalled from the Admirals ECHL affiliate the Cincinnati Cyclones. It’s unclear as of now whether or not Pekka Rinne was out from practice for the Predators purely for a maintenance day or if Saros and Mazanec will provide goaltending duties tomorrow night up in Toronto. Time will tell. And, luckily, there isn’t exactly a lot of time before things get all that more clear. What does seem to be clear, regardless of how moves shake out, is that Jonas Gunnarsson will be getting his second start of the season for the Admirals tomorrow night. Gunnarsson’s North American pro debut did not go so well but I’d argue there wasn’t much he could do on the night as the defense sort of fell apart in a 6-1 win for the Iowa Wild at the Wells Fargo Arena. Gunnarsson has been patiently waiting to get another crack at it ever since. As far as everything else that took place at today’s morning practice? That too was a little bit, well, different. I felt like I was watching some sort of a video game at times with all sorts of different practice equipment on the ice all at once. The majority of practice was conducted with an emphasis on these skill drills with the practice tools in use. It wasn’t your typical practice day so, as far as line combinations go, the best I can offer up is that it is exactly the same minus the fact that Adam Pardy was absent from practice today as he is nursing a lower-body injury. It’s unclear whether or not today was simply a day of recovery for him or if he will miss tomorrow night because of it or not. 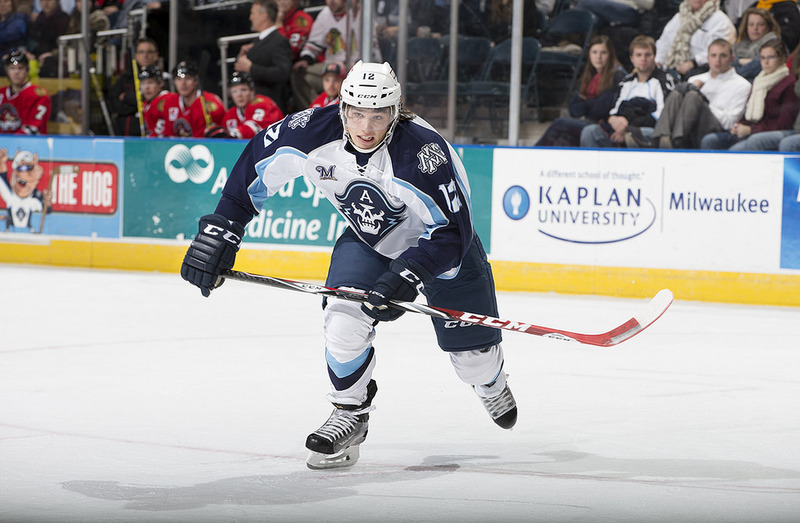 If so, the Admirals would likely rotate in Jonathan Diaby who did perform rather well in his brief spell with the Cyclones. Once practice came to an end I spoke with Milwaukee Admirals head coach Dean Evason to get his comments on the goaltending moves that were made as well as what it will be like when his ol’ teammate Ulf Samuelsson takes the bench as head coach of the Charlotte Checkers tomorrow night. I then chatted with Harry Zolnierczyk who was shadowed by his new PR Director Trevor Murphy. With Visentin now back in Milwaukee I had the chance to ask him about what it was like starting against his former team on the day of the food poisoning chaos in the organization. And -thankfully- I did get the top requested Kevin Fiala to round out the day and ask up one of the age old questions: what is up with the stick tape? Exhibit A, B, C, and D. It is always a fun topic to bring up and one that had him actually wanting to show me how he tailors his stick blade for use. I might take him up on that next time. Anyways! Busy day. Busy after practice wrap-up. Here is the talk from the locker room today. In a final note, I did have a quick discussion with Justin Kirkland today specifically about why he changed his number from #24 to #19. As you may have known Kirkland’s number in Kelowna was #23 and that number was unavailable as the now team captain Trevor Smith chose that and had veteran preference to it. With that unavailable he went one-up but once Eric Robinson was traded to the Springfield Falcons it opened up the #19 which Kirkland wore growing up. He asked if he could make the change and was given the thumbs up. 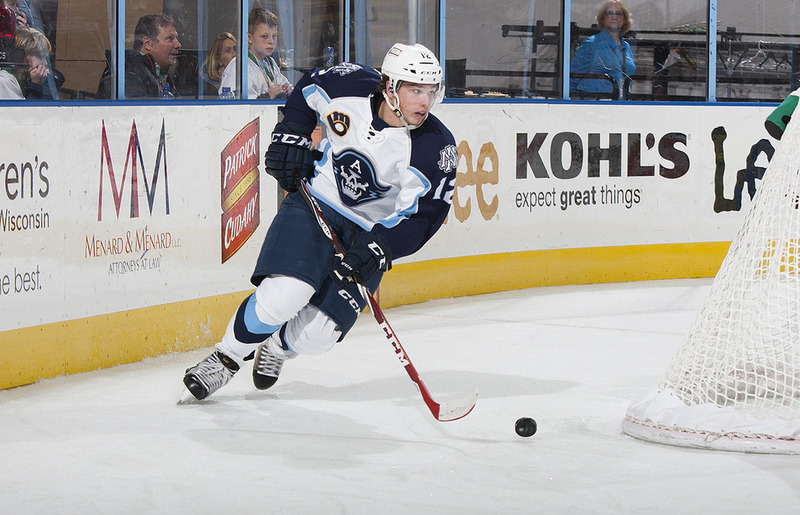 Be sure to keep updated with Admirals Roundtable through social media platform of your choice: follow along Twitter, like us on Facebook, get photo updates on Instagram, and listen along on SoundCloud.